Outcrop of the Meade Peak Member of the Phosphoria Formation near the Vernal mine. The underlying cross-bedded rock is the Weber Sandstone. Utah hosts a long list of economically important industrial minerals, and phosphate rock is definitely on the list. Phosphate rock has over 100 years of history of Utah production, primarily for use in fertilizer. Phosphate is an important source of phosphorous, and should not be confused with potash, which is a source of potassium for fertilizer and is also produced in Utah. Phosphorous is one of the three essential plant nutrients, along with potassium and nitrogen, hence its use in fertilizer. Phosphate is also used to produce phosphoric acid and elemental phosphorous for a variety of industrial applications. According to the U.S. Geological Survey, China, the U.S., Morocco, and Western Sahara are currently the largest producers of phosphate rock. Most of the U.S. phosphate production comes from Florida and North Carolina, but Idaho and Utah are also producers. 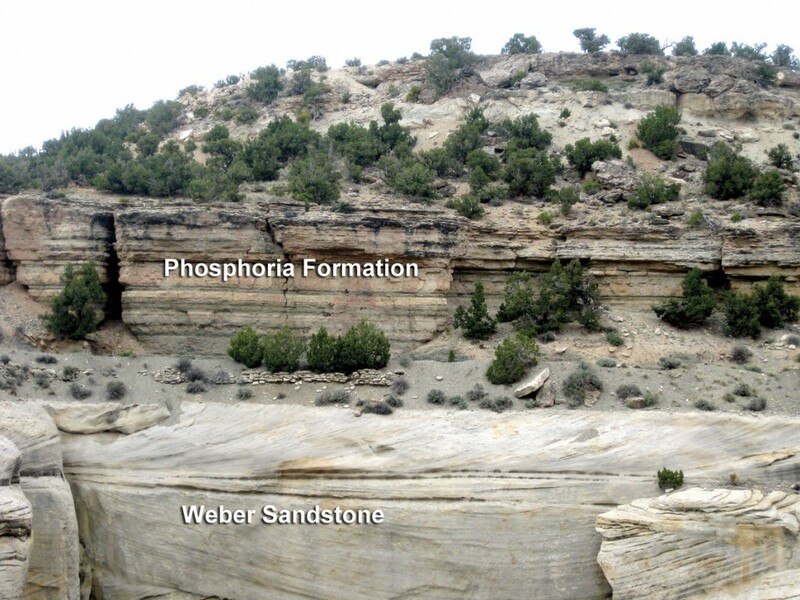 Significant sedimentary deposits of phosphate rock occur in Idaho, Utah, and, to a lesser degree, Wyoming and Montana. The quality of phosphate rock is most often expressed in P2O5 content, and some of the world’s richest phosphate rock deposits contain 30 percent P2O5 or better. Utah contains some of these rich deposits, but some of Utah’s lower-grade deposits are equally as important. Utah’s phosphate resources occur primarily in rocks deposited in an ocean basin that covered much of northern Utah during Permian time (over 250 million years ago). 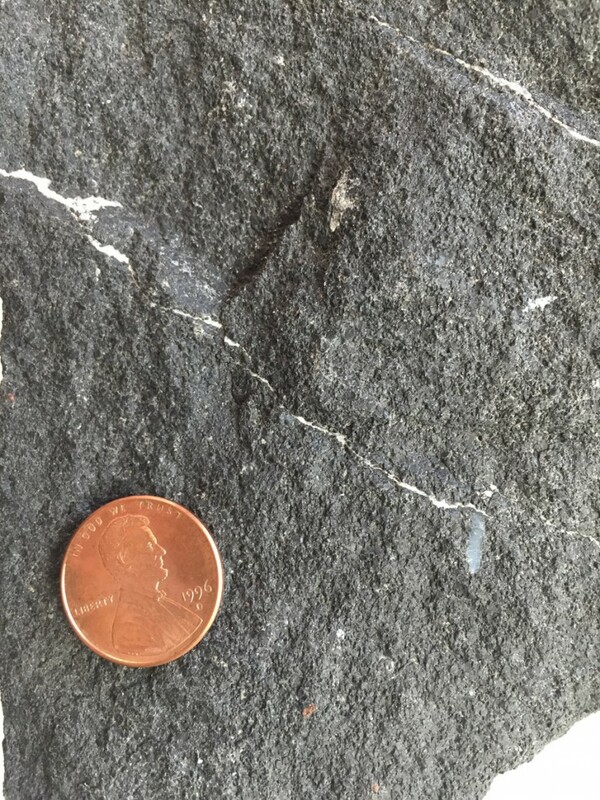 The Permian marine conditions were ripe for depositing the mineral apatite, or more specifically, carbonate-fluorapatite, which is the primary ore in the phosphate deposits of the western U.S. The exact conditions and mechanisms to precipitate the Permian apatite in the western U.S. are an ongoing source of study and discussion. 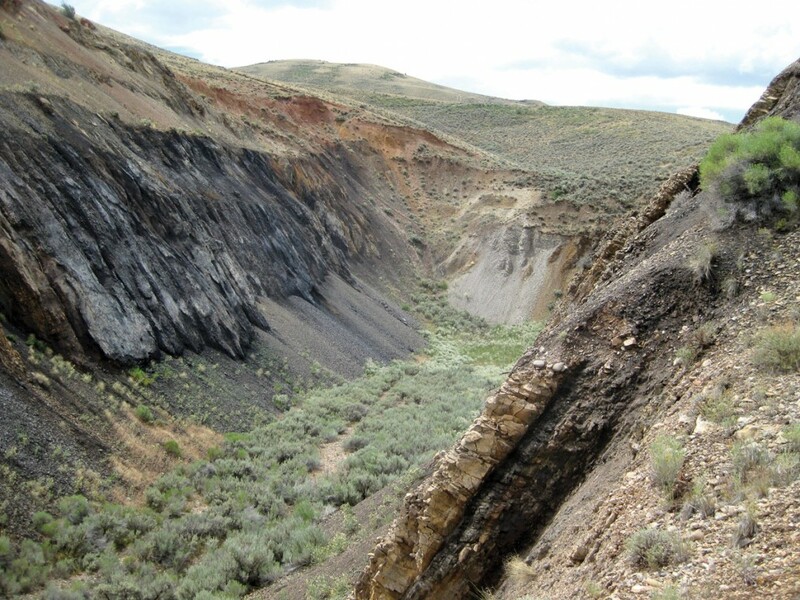 The main geologic unit that hosts the phosphate deposits is the Meade Peak Member of the Phosphoria Formation, which is made up of dark-colored phosphorite (a rock composed primarily of apatite), mudstone, and carbonate. 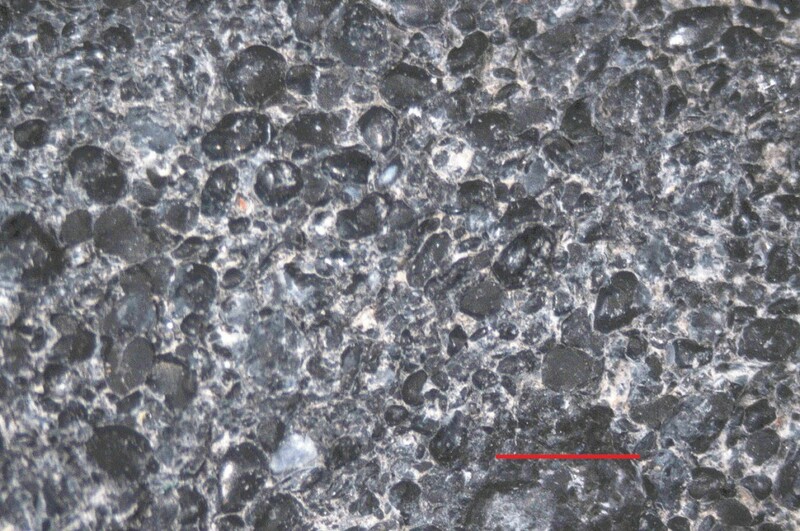 Structureless pellets and nodules, fossil fragments, oolites, and pisolites (oolites and pisolites are grains that exhibit concentric layering) often comprise and define the texture of the phosphorite of the Meade Peak, and pelletal phosphorite is probably the most common. In northeastern Utah, the Phosphoria Formation commonly occurs as a tongue (or zone) within limestone, dolomite, and sandstone of the Permian Park City Formation (see map). Where present, the Meade Peak Member ranges from very thin to about 225 feet thick. However, depending on the location, only part of that makes for an economic resource. Generally, only specific zones in the Meade Peak are high enough grade to be of economic interest, which is currently around 20 percent P2O5 or better, and the entire thickness of the Meade Peak generally averages considerably lower grade than that. A few attempts have been made to define Utah’s phosphate resources, but the estimates vary widely due to differing assumptions and minimum grades. Suffice it to say, Utah has hundreds of millions of tons of in-place resources, but only a fraction of those resources are likely to be mined due to low grade, unfavorable deposit location, or mining configuration. However, expansion of current production appears likely due to depleted resources elsewhere and growing demand. Details vary, but most sources agree that phosphate in Utah was first discovered and produced in the late 1890s along Woodruff Creek, southwest of the town of Woodruff in Rich County. Only a small amount of phosphate rock was produced near Woodruff Creek, and in the early 1900s production shifted to the Crawford Mountains, also in Rich County. Production from the Crawfords was intermittent in the first half of the 20th century, but became more regular in the 1950s through the mid-1970s. The Crawford Mountains hold some of the highest grade (greater than 30 percent P2O5) phosphate deposits in Utah, but the complex geologic structure of the Meade Peak Member in the area required underground mining, which is substantially more expensive than shallow surface mining. Production from the Crawfords has been negligible since the late 1970s. Currently, phosphate production in Utah comes from the southeast flank of the Uinta Mountains, north of Vernal in Uintah County. The San Francisco Chemical Company began production at the Vernal mine in 1961. The mine has had multiple owners, and J.R. Simplot has been the sole owner of the mine since 2003. Simplot mines a nearly 20-foot section of the Meade Peak Member that averages about 19 percent P2O5. The sedimentary rock layers in the area of the mine are relatively flat (they dip gently to the south) and the phosphate is close enough to the surface to allow for surface mining. Once Simplot mines the phosphate rock, the rock is processed and upgraded to about 30 percent P2O5. The upgraded ore is slurried via pipeline to Rock Springs, Wyoming, where it is further processed into fertilizer. Records are not available from the initial years of production, but the Vernal mine has probably produced over 100 million tons of phosphate rock in its lifespan. In 2014, Simplot mined 4.1 million tons of phosphate rock and produced approximately 1.5 million tons of phosphate concentrate. Based on the U.S. Geological Survey’s average phosphate rock price in 2014, Simplot’s 2014 production has a value of about $126 million. Exploration and investigation of the phosphate resources in Utah are underway in the southeast Uinta Mountains both west and east of the Vernal mine. Utah Phosphate Company has explored and drilled west of the Vernal mine in the Ashley Creek area to define the phosphate resource in that area. Utah Phosphate Company is a subsidiary of Agrium, a large fertilizer company operating primarily in North America. East of the Vernal mine, Utah Mineral Resources, mostly owned by Strata Minerals Inc., is confirming and expanding a phosphate resource drilled and defined by U.S. Steel Corporation in the late 1960s. A National Instrument 43-101 compliant resource estimate for their land holdings is available to view online at the Utah Geological Survey’s website (http://geology.utah.gov/webmap/reportviewer/index.html). Given the important role of phosphate for agriculture and food production, a stable mining jurisdiction with sufficient resources like Utah may provide a good opportunity for new or expanded production of phosphate rock.